NARFE-PAC protects NARFE members' pay and benefits by raising and spending money to elect members of Congress who support the federal community. NARFE-PAC contributions also helps build strong relationships with lawmakers, a key component to winning legislative fights. During the 2017-2018 election cycle, 32,204 NARFE members contributed $1,895,908 to NARFE-PAC, which includes 209 monthly sustainer contributions. The average contributor gave $58.87. NARFE-PAC gave a total of $1,104,250 for political purposes. $914,250 to 108 Congressional candidates, of which 94 won, 7 lost, 3 retired, two decided to run for another office and 2 were not in cycle. So over 87% recipients of NARFE-PAC won - not bad. In California, 2,009 members contributed $138,772.50; and 69 members are making monthly sustainer contributions. Make an investment in protecting your earned benefits by supporting NARFE-PAC today! 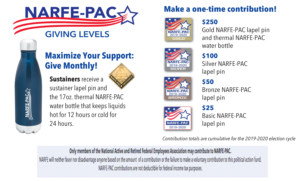 Contribute with your credit card to be a monthly sustainer of NARFE-PAC! Chapters advise the DVP of their decision; the DVP advises the Federation PAC Coordinator, who in turn advises HQ of the decision.